Somewhere in the African savanna, a cheetah is on the hunt. She could easily outrun a zebra, but it would be too large to take down: Antelope like the impala are more her size. You might think the cheetah, a predator that holds the title for the fastest land animal, would catch her dinner with ease. Despite her streamlined athletic body – long legs, extra large heart and lungs, feet that grip like running cleats – she fails to catch her prey 75% of the time according to research at The Royal Veterinary College, University of London, UK, and Botswana Predator Conservation Trust. Whether it be to catch dinner or to avoid being dinner, nature has molded predator and prey pairs, such as cheetah with impala and lion with zebra, so that competition is fair. When all is in balance, predators have enough to eat without depleting their food source, and the ecosystem is in balance. Cheetah and impala have been competing for perhaps hundreds of thousands of years. Evolution has tweaked genes to enhance running in both of these animals. We are learning which genes have evolved for speed in cheetah thanks in part to Cheetah Conservation Fund’s cheetah genetics research. 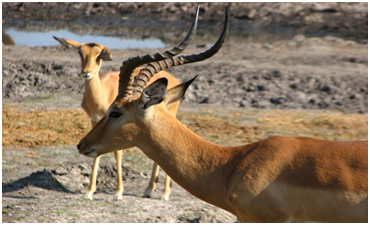 An impala’s body: a compromise in evolution to be good at both foraging and running fast. The impala is not fast enough to win a race with a cheetah but it does have a trick that evens things out. Instead of running full speed ahead, the impala escapes the cheetah by slowing down and quickly changing direction. 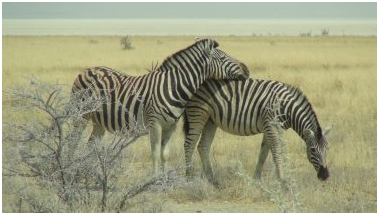 This insight, plus many more on the movement of cheetahs, impalas, lions and zebras in northern Botswana, was recently published in Nature. This research was lead by Professor Alan Wilson at The Royal Veterinary College, London, and included researchers at Botswana Predator Conservation Trust and Okavango Research Institute, University of Botswana. Researchers placed remote tracking collars containing Global Positioning Systems and electronic motion sensors on the animals to collect data on athletic abilities like acceleration, deceleration, running speed, turning and stride. 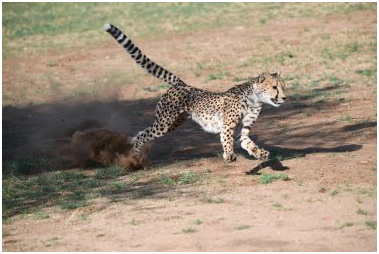 Before the team started using this technology, measurements of cheetah speed had mostly been made on captive animals running in a straight line chasing a lure. Cheetahs can reach 59 mph (94 kph) even when running through vegetation, but they normally run at half this speed. This fits with computer modelling which predicts predators should run only slightly faster than their prey. 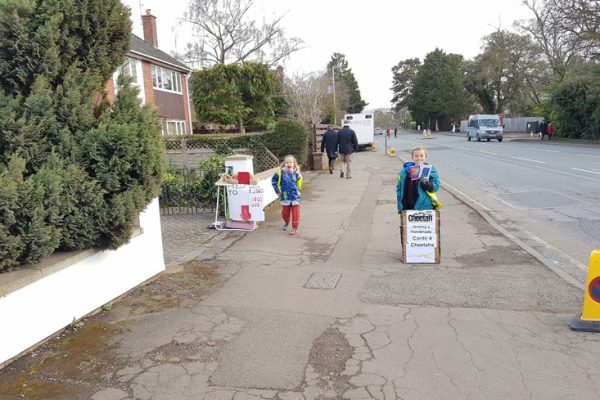 Slowing down allows them to manoeuvre better. Prey have the advantage of deciding which way to go and changing direction a split second before the predator can respond. Cheetahs and lions sometimes succeed at changing their direction quickly enough to capture their prey because they are more athletic than their soon-to-be meal. This means cheetahs and lions are faster and better at accelerating and decelerating then their respective prey, the impala and zebra. By testing small muscle biopsies, researchers have also discovered that muscle fibres have more power. Professor Wilson’s team is working on tracking more groups of predators and prey. The team will investigate how different habitat features and resources like water can affect daily animal activities, hunting and evading capture. Knowing how different habitats affect cheetahs and other animals that keep their ecosystem in balance should guide cheetah conservation efforts everywhere. Founded in 1990, the Cheetah Conservation Fund (CCF), is the global leader in cheetah research and conservation and is dedicated to saving the cheetah in the wild. 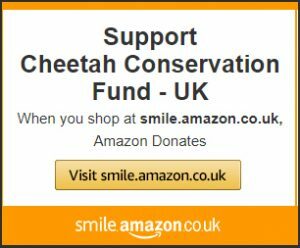 Through CCF, you are supporting an established and proven multi-layered approach to cheetah conservation. 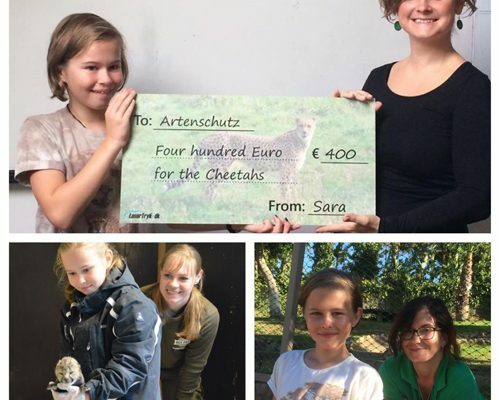 A donation by you will be targeted and focused to directly affect the wellbeing of cheetah and human populations that share the same landscapes in Namibia and in other cheetah countries in Africa. Dobrynin, P., S. Liu, G. Tamazian, Z. Xiong, A. A. Yurchenko, K. Krasheninnikova, S. Kliver, et al. 2015. 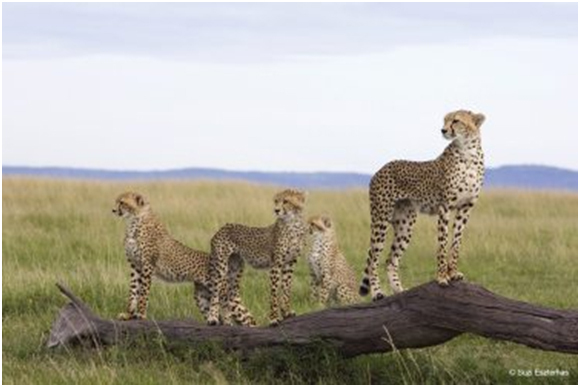 Genomic legacy of the African cheetah, Acinonyx jubatus. Genome Biology16 (1): 277. doi:10.1186/s13059-015-0837-4. http://dx.doi.org/10.1186/s13059-015-0837-4. Hayward, M. W., Hofmeyr, M., Obrien, J., & Kerley, G. I. (2006). 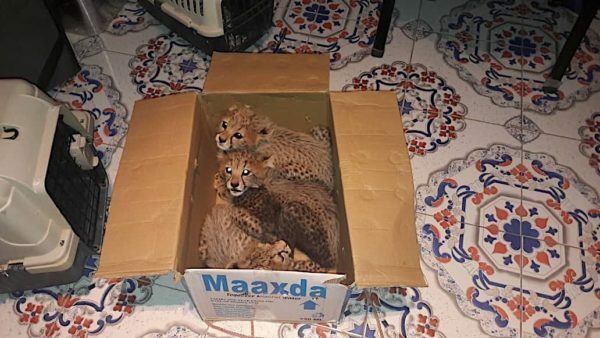 Prey preferences of the cheetah (Acinonyx jubatus) (Felidae: Carnivora): Morphological limitations or the need to capture rapidly consumable prey before kleptoparasites arrive? Journal of Zoology,270(4), 615-627. doi:10.1111/j.1469-7998.2006.00184.x.